Outdoor furniture cushions can turn your plain outdoor dining set or patio furniture into something colorful, comfortable and inviting. From fresh blue and white stripes to solid colors of light blue or lime green, a fresh set of patio cushions can transform your old outdoor patio set into a one that has a fresh and updated look. The secret it to get fabric that is UV resistant and repels moisture, stains and mold. Sunbrella outdoor fabric is the most durable thanks to applying dye all the way through the fabric - not just on the surface. To keep your outdoor cushions water repellant it's a good idea to spray the cushions every 1-2 years with a water-repellant spray, like . Eventually the original protective spray wears off and needs to be reapplied. Is it time for you to update and refresh the look of your outdoor patio furniture? 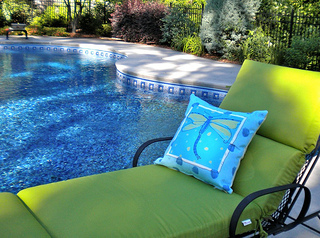 Patio chair replacement cushions can provide comfort and color to your outdoor pool area. We just bought a set of new outdoor chair cushions for our outdoor patio table chairs - it feels and looks like a new set of furniture. 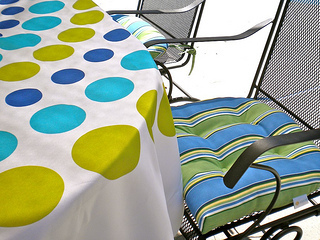 A new umbrella tablecloth looks great on the table, but a new set of seat cushions makes the set look like new. 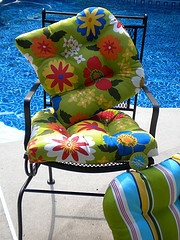 Chaise lounge cushions provide not only comfort but also style and color to your outdoor patio area. When we bought our outdoor furniture several years ago we bought the patio chaise cushions to match our outdoor chair cushions. This time I wanted a variety of coordinating colors and patterns. If you are shopping for a new patio chaise, sometimes the cushion will be included. Take that into account when you are comparing prices. The best selection of styles and colors is found in the spring and early summer. If you don't find what you are looking for, shop on line. That's what I did when I decided I wanted chartreuse green. I also love how thick the new cushion is, as well as, the long lasting and fade resistant Sunbrella outdoor fabric. Find some tips on measuring and choosing the best fabric, style and design for your outdoor pool area. 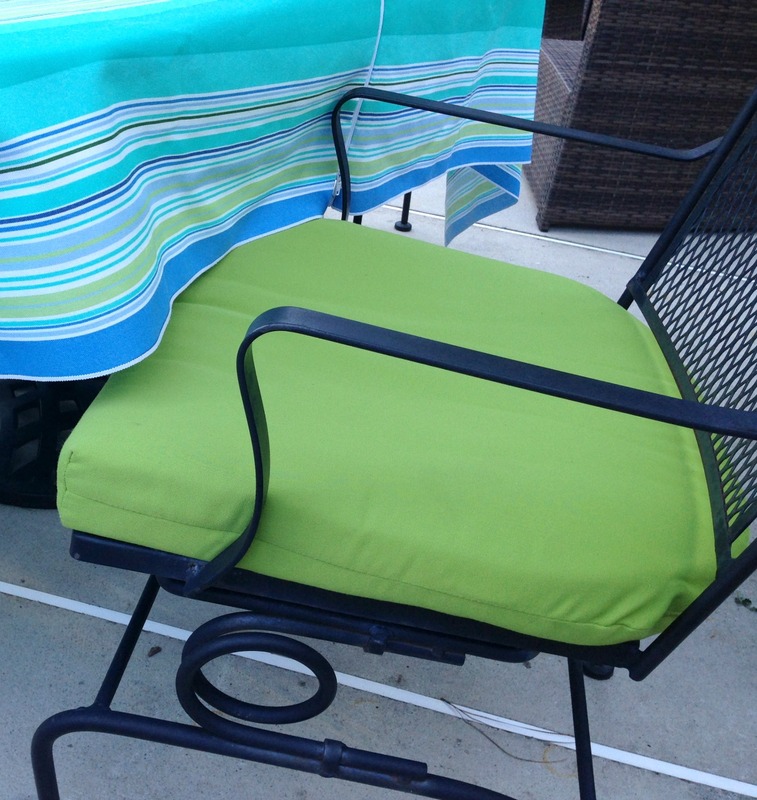 If you'd like to keep your chair cushions for several years without them fading or getting stained and moldy, spend the extra money on Sunbrella chair cushions. I like to leave my cushions out all summer. They are exposed to lots of sun and are left out in the rain, yet they keep their vibrant color and don't get lots of spots or stains thanks to stain and mildew resistant fabric. 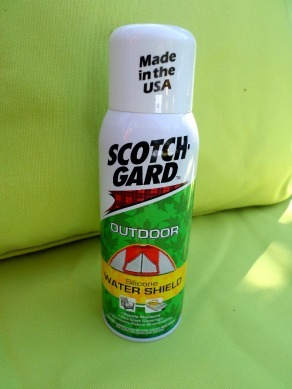 Before you set out your outdoor chair cushions apply Outdoor Scotch Guard protective spray. Be sure you are outside to spray the cushions. We applied a heavy layer all over them. The cushions have held up really well - we've left them outside in the rain and during some heavy storms - we meant to bring them in - but they still look good. No staining and the water beads up. We like to do this in the beginning of each summer to protect our investment. Once summer hits our outdoor furniture cushions are often left outside. But there are times when we do want to protect them from days of rain, heavy pollen or sun damage. Bringing them into the house or garage takes too much effort running back and forth and even then we don't have a good spot to store them. 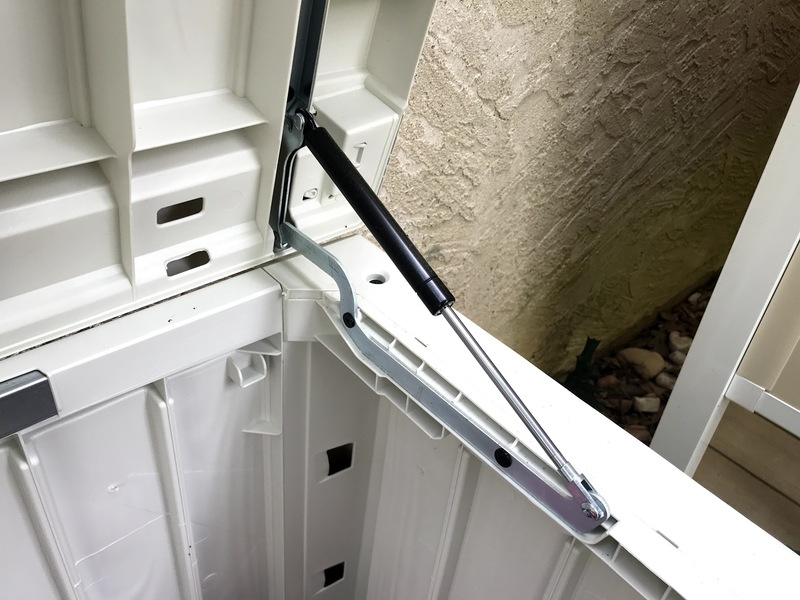 That's why I like this convenient deck storage box by Keter. This time around we looked for the largest deck storage box we could find and it was this 150 gallon one. It is super spacious with tons of storage room. The opening mechanism makes for a smooth open and close - which means the top won't coming slamming down on your head. 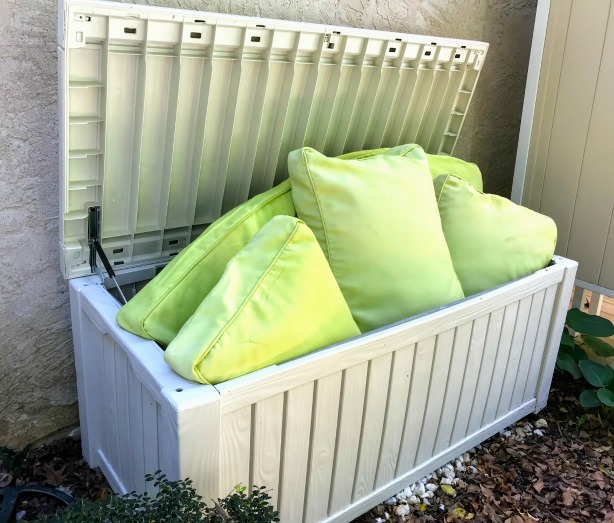 You will find it super convenient to store your outdoor cushions and by keeping your cushions protected when you are not using them, they will last longer. Turn your backyard into an oasis of color and comfort with outdoor furniture cushions.